Lori Lightfoot celebrates being elected Chicago’s first black female mayor, and the first openly gay person in the office, at the Chicago Hilton on April 2, 2019. 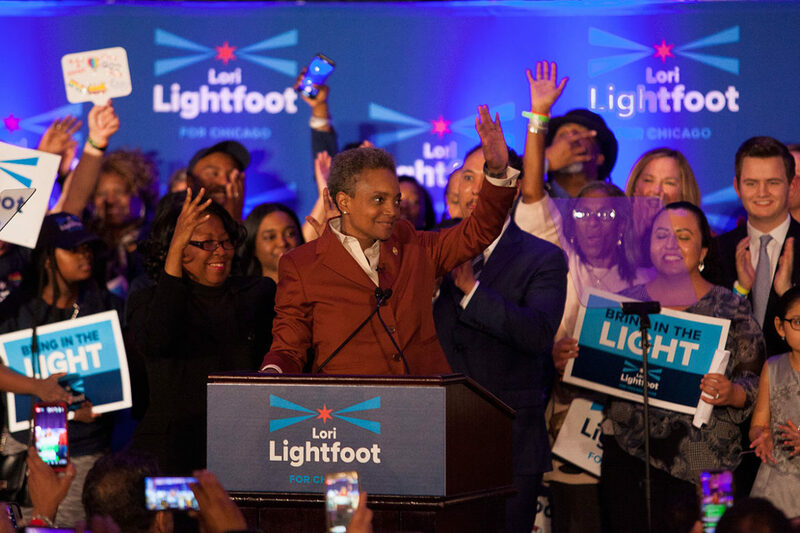 Lori Lightfoot’s stunning victory—a three-to-one margin in which she carried every single ward in the city—gives her a clear mandate for change. But given the huge challenges Chicago faces, she will need to marshal her political capital with great skill. In a historic mayoral election, Lori Lightfoot beat Toni Preckwinkle in every ward, according to data from the Chicago Board of Elections. Her come-from-way-behind campaign gives evidence that she may be up to the task. Starting with the support of a handful of reformers—and aided by a corruption scandal that tainted all the frontrunners in the race—she eked out a first-place victory on February 26 and then pulled together a strikingly broad coalition. She ran a virtually flawless campaign, seeming to confirm widespread testimonials to her high level of competence. It was a sharp contrast to her opponent, Cook County Board President Toni Preckwinkle, who floundered from one unforced error to the next. Two incidents involving Preckwinkle supporters helped propel Lightfoot to victory. Before the primary, State Sen. Robert Martwick crashed a press conference Lightfoot had called to oppose his bill to make the position of county assessor appointive, just weeks after reformer Fritz Kaegi defeated Assessor Joe Berrios, an ally of Preckwinkle and Martwick. The image of Lightfoot standing up to the oversized Martwick as he loomed over her cemented her image as a reformer and a fighter. And at a Preckwinkle rally ten days before the runoff election, U.S. Rep. Bobby Rush unleashed a vitriolic attack, accusing Lightfoot supporters of responsibility for police killings of black youth. That accusation – which Preckwinkle subsequently stood behind – clearly did not win many voters to his candidate, and certainly turned many away. Bobby Rush should start planning his long-overdue retirement party. Lightfoot and Preckwinkle ran on very similar, generally progressive platforms. 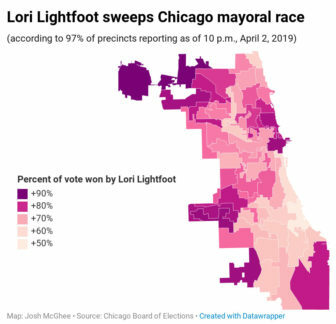 And while most voters found Lightfoot more credible, progressive leaders and activists were split between the two candidates’ camps. Several big unions and progressive elected officials backed Preckwinkle early, probably based on the assumption that she was the front-runner. After the scandal broke around the federal investigation of Ald. Ed Burke, which included charges the finance committee chair allegedly strong-arming developers for donations to Preckwinkle, her momentum collapsed. The unions doubled down, depicting Lightfoot as “Rahm 2.0,” a characterization that didn’t seem to resonate with large numbers of voters. Perhaps that’s because people had seen Lightfoot standing up to Mayor Rahm Emanuel’s resistance and intransigence on police reform over the past couple years. Preckwinkle, on the other hand, was much less outspoken regarding Emanuel’s leadership. On top of that, by staying out of the 2015 election, it was Preckwinkle as much as anyone who enabled Emanuel’s second term. One sad irony that should be noted in the wake of such a resounding loss: Preckwinkle could have won four years ago if she’d had a courage to take on Emanuel. Another group of Lightfoot detractors consists of the most radical young police accountability activists, including police abolitionists. These activists reject the growing role of reform advocates from within law enforcement, a trend Lightfoot exemplifies. In Chicago, this trend goes back to the Afro-American Police League, and includes whistleblowers from inside law enforcement who played indispensable roles in exposing the torture ring led by Jon Burge and the existence of the video of Laquan McDonald’s shooting—the two key developments of recent decades on this issue. It includes the comprehensive, pragmatic proposals by President Barack Obama’s Task Force on 21st Century Policing and the Police Executives Research Forum, both of which have won the support of police chiefs across the country. It includes a new wave of locally elected prosecutors committed to decreasing incarceration levels. It’s reflected in the Justice Department’s investigation of the Chicago Police Department and the Illinois attorney general’s lawsuit—alongside legal actions by community groups and civil rights organizations—that forced Emanuel to agree to a consent decree for CPD with judicial oversight. 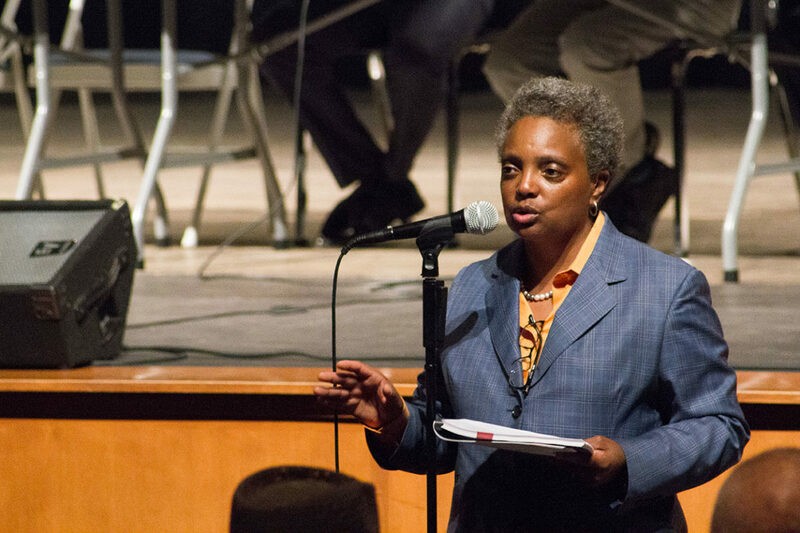 Voters who want concrete changes now responded to Lightfoot’s record of demanding action from Emanuel on specific issues like banning choke holds and shooting into crowds, restricting foot chases, and documenting incidents in which police point guns at civilians. The mayor-elect now faces the challenge of transforming a broad electoral coalition into a governing coalition in the City Council. She will not face an intransigent opposition bloc the way Mayor Harold Washington did in the 1980s. That means she will have some room to maneuver, and many will be watching how she orders her priorities. The new council will have a larger—and more progressive—Progressive Caucus, with the election of an impressive cohort of young black and Latino activists. Aldermen-elect Jeanette Taylor (20th), Byron Sigcho-Lopez (25th), , and Andre Vasquez (40th) all have community organizing backgrounds, as do first-round winners Daniel La Spata (1st) and Maria Hadden (47th). Rossana Rodriguez Sanchez’s lead in the 33rd Ward was close and mail-in ballots are yet to be fully counted. In the 46th ward, Ald. James Cappleman’s narrow lead over neighborhood activist Marianne Lalonde was also too close to call. Vasquez’s clear victory over longtime Ald. 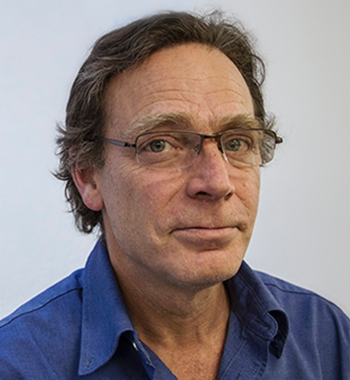 Patrick O’Connor showed the incumbent’s alliance with the Emanuel to be a serious liability. In the mayor’s own 47th Ward, Matt Martin, a civil rights attorney who worked on the CPD consent decree in the Illinois attorney general’s office, bested a former Emanuel policy advisor. Two other organizers fared less well. Police accountability activist Will Calloway was lagging Ald. Leslie Hairston in the 5th Ward, but even if he ends up losing, he has succeeded in forcing Hairston to back a community benefits agreement for the Obama Presidential Center. Hairston is now chattering about who she’ll bring to the table for negotiations, but 20th Ward alderman-elect Taylor—an activist with the Obama CBA Coalition—has promised to introduce a CBA ordinance, and she will be the one to take the lead on this issue. In the 15th Ward, Rafael Yanez lost once against to Ald. Raymond Lopez, who has a knack for getting media coverage. The race pitted two visions of how to address public safety against each other; apparently Lopez’s get-tough approach won out. But Yanez, a police officer and strong proponent of community policing who has also organized an array of effective youth programs, has much to offer. He could play some kind of leadership role as the city steps up efforts to improve policing and reduce violence. The new organizer-aldermen are likely to make the Progressive Caucus a stronger force and push the new mayor on a number of issues. Meanwhile, all three of citywide elected positions—mayor, treasurer, and city clerk—are now held by women of color. Chicago faces a host of challenges, particularly with a tightening fiscal vise and little prospect for progressive revenue options that require action from Springfield, where the preoccupation is on the crucial task of fixing the state’s income tax. But it’s clear that Rahm Emanuel’s agenda and governing style have been thoroughly repudiated. And perhaps the culture of Chicago politics—which predates Emanuel by a century—has reached a turning point. After years of struggle within the Chicago Police Department, retired black police officers share common pain with young organizers struggling in a moment of their own. There is no law written that address the issue of aldermanic prerogative. For all the talk, what can be done about it? Suppose an issue comes up that requires approval by the City Council voting as a whole. The alderman of the ward containing the issue stands up and says: “This is my opinion: ” and the other 49 alderman listen. Would they vote against the option of the alderman for that ward? The alderman lives there and was voted in by the residents that live there. Isn’t it reasonable to respect their opinion? It’s possible one alderman for an adjacent ward might disagree. They are from to stand up and express their opinion. Again, the whole council will vote to resolve the issue. There’s a lot of weeping and gnashing of teeth about aldermanic prerogative but not much can be done about it.